Opening double-page from the Ian Edginton interview by Matthew Badham. 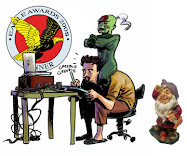 Artwork from Red Seas, right, by Steve Yeowell. Cover from Leviathan, integrated into layout, left, by me. Design by Pye. 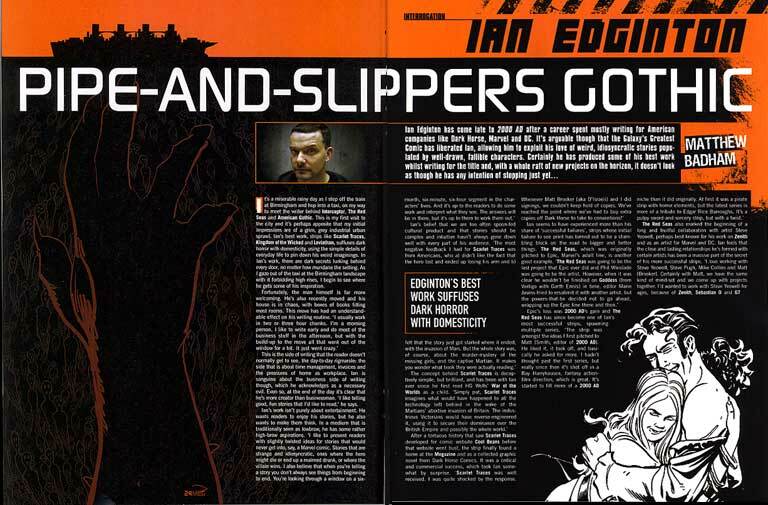 ...for this month's Judge Dredd Megazine which features an interview with my old partner-in-crime Ian Edginton. It's an excellent read, illustrated with lots of images from our joint projects, including a preview of the cover of the forthcoming Leviathan collection (I don't have a date on that yet, btw, but it's definitely coming forth). They've also used my 2002 photograph of Ian, which funnily enough, is more of a thrill than seeing my artwork used; I suppose I'm used to being in print as an artist, but not as a photographer. 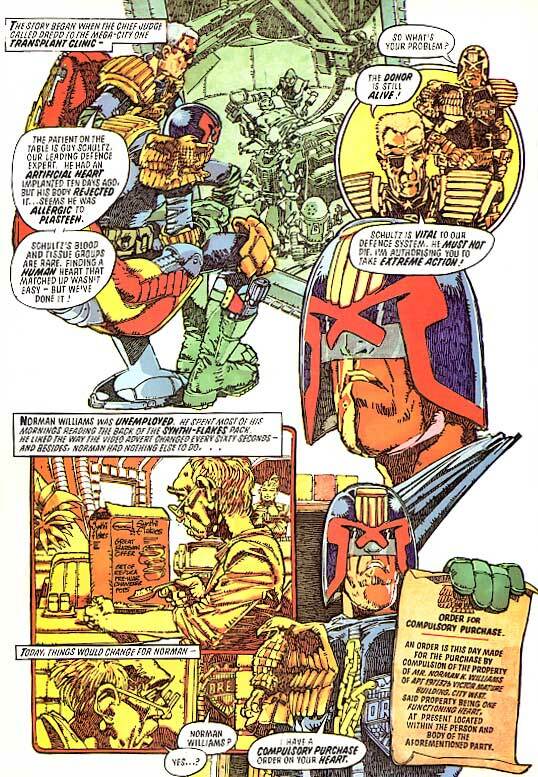 Also, 11/10 to editor Matt Smith for finally reprinting one of Mike McMahon's stonking colour strips from the 1981 Judge Dredd Annual in full, albeit slightly over-livid, colour. IMHO, the six colour strips McMahon produced for the 1981 & 1982 annuals (along with Slaine: Sky Boats and The Last American,) represent his best work, and have been unjustly neglected for a long time. I hope we'll see the other colour strips reprinted in the coming months. 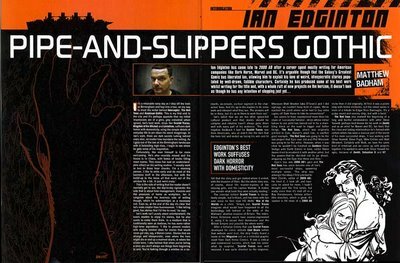 Above: page two of Compulsory Purchase, written by John Wagner (writing as John Howard), art by Mike McMahon, reprinted in The Judge Dredd Megazine 247. This copy scanned from the 1981 Judge Dredd Annual. The Last American was superb. Great to see his work being reprinted. Nice photo, by the way, do you keep a flickr account? Woodrow Phoenix has a wonderful gallery of photos you can visit here. I do indeed keep a Flickr account (see the links bar on the main page of this blog). I've added Woods as a contact, so thanks for that. Should have checked your links bar, distracted somewhat by all the art you keep putting up. ha! "Cycling Foetus" is a great picture by the way. Rainman. The film starring Tom Cruise and Dustin Hoffman. The one bit about that movie that I really love is all the photographs Hoffman supposedly randomly took which are displayed during the end credits roll. I love that sense of accidental composition, images framed purely by chance. I've never seen Rainman, but you make me want to catch up with it now. The best film I've ever seen for capturing the deliberate act of street photography, that sense of trawling the world, waiting for some conjunction of people, objects or events to fall into place in front of your lens, is The Public Eye, starring Joe Pesci. It's based loosely on a real character, the New York press photographer Arthur Fellig AKA "Weegee the Famous." Looks like this is going to turn into a movie club. I've got Titan A.E. to watch and now Public Eye. Actually, good call on Public Eye, that's a movie I haven't seen but wanted to when I first saw the trailer for it all them years ago and then forgot the title. I have a library of movies like that. Example: "yeah, you know the movie, the one with the guy in it wearing brown trousers who plays the flute?" Now you've reminded me of the name of it I've got to seek it out. Thanks for the tip off. RE: Rainman. Hoffman plays his character the way I like him to play characters in a movie; with all the conviction he put into those early movies like Marathon Man and All the Presidents Men. It's a great, heart warming performance. Cruise also. I like it when he plays a dislikable character (intentionally). So, in all I'd say it's a good film. But it is a heck of a long time since I saw it. So this could be like one of those embarrassing purchases in your record collection you forgot to throw out when you started seeing girls, if you get my drift. Example: "Culture Club? When was I into Culture Club?" But, I recommended Q&A (Nick Nolte movie) to a friend of mine the other day and I hadn't seen that in ten years, and that still held up, so, maybe we're safe with Rainman. I have Titan AE to keep me busy in the meantime. Shall have to see if it comes up no ebay.